Hope ProductionsActor Akshay Kumar on the set of ‘Padman,’ an upcoming Bollywood film that aims to increase access to sanitary products for women and girls. Akshay Kumar – one of the biggest names in Bollywood – will play the lead role in “Padman,” a movie inspired by the true story of a man who invented a low-cost device to make sanitary pads for women and girls in his village. The film aims to remove the stigma around periods. Kumar told Business Insider that he believes entertainment can normalize taboo subjects in a way that other mediums can’t. Around the world, millions of low-income women and girls do not have access to sanitary pads or tampons. As a result, many miss or drop out of school, stunting economic opportunities down the line and reinforcing taboos around menstruation. The issue is especially prevalent in rural India. In a 2016 Nielsen survey, 93% of girls in Bihar and Jharkhand, India – rural states in the country – said they miss one to two school days every month during menstruation on average. An upcoming Bollywood film called “Padman” aims to help remove the stigma around periods. One of the most famous actors in Bollywood, Akshay Kumar, plays social activist Arunachalam Muruganantham – the lead role in the film, which is inspired by a true story. Known as “India’s Menstrual Man,” Muruganantham invented a machine that could produce low-cost sanitary pads for women and girls in the early 2000s. The machine – which he is working to expand to 106 countries – can make pads for less than a third of the price of ones by commercial brands. In an interview with Business Insider, Kumar said he believes that movies (and entertainment in general) can be a powerful way to turn the tide on taboos. Hope ProductionsActors Sonam Kapoor (left) and Akshay Kumar (right) on the set of ‘Padman,’ an upcoming Bollywood film. Twinkle Khanna, who is married to Kumar and serves as one of the film’s producers, said that “Padman” is a story about an innovation that improved the lives of women. She adds that “Padman” seeks to alleviate the burden of shame that comes from having a period in India. It’s uncertain whether the film will achieve the ambitious goal of normalizing menstruation, but a huge name like Kumar could make that more likely. 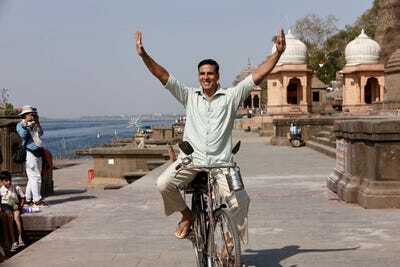 “Padman” is set to release worldwide on January 26.